'Udallia', the Roswell Eldridge estate built c. 1910 in Saddle Rock (Great Neck) with landscaping by Beatrix Jones Farrand. 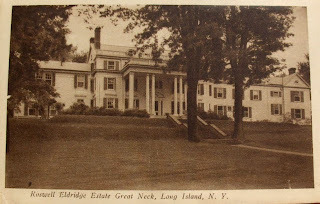 Eldridge was president of the Bank of Great Neck and founder and first mayor of the Village of Saddle Rock. It appears 'Udallia' has since been demolished. 2) I don’t think it was White. Nice, big house. Interesting columns. Per the Great Neck Library the estate was known as "Redcote"
That Wilson Eyre & McIlvaine produced drawings, plans and elevations for "Redcote"
Although a large colonial such as the one built (and razed) doesn't look to be Wilson Eyre's style or hand. Additionally the book 'The Architecture of Delano & Aldrich' shows in 1933: "Mrs Lewis Edlridge House, Redcote, alterations. Bayview Ave., Great Neck, New York. Demolished." 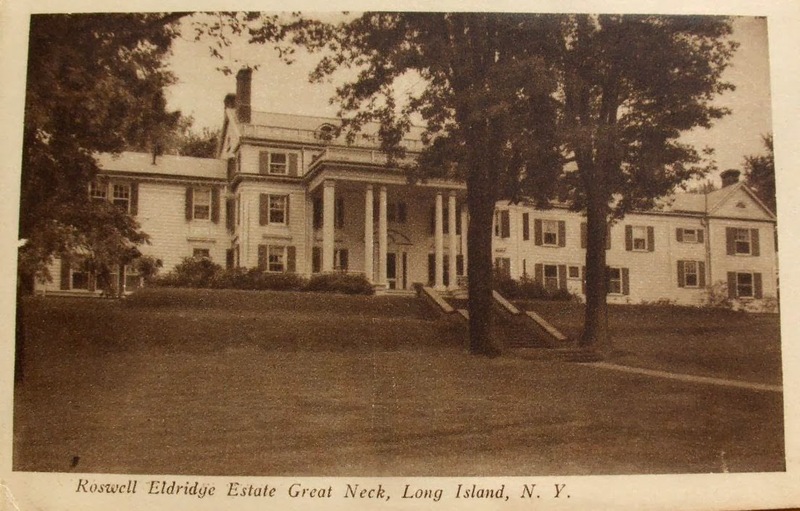 Another Great Neck library publication: "Little remains of the original Eldridge estate. Along Grist Mill Lane can be seen the caretaker's cottage and the chauffeur's home and a few less easily identified smaller buildings." Lewis Eldridge was Roswell Eldridge's brother. Roswell died in 1927. In 1930 his brother Lewis and his wife Elizabeth built 'Redcote' by D&A. Impressive research Kellsboro -- thanks for at least not documenting it was designed by Stanford White. Well I have thoroughly confused myself. Since the D&A alterations date to 1933, six years after the death of Roswell, it is possible that the two houses are one and the same. For what it is worth, the only Eldrige listed in the 1929 Great Neck telephone directory is Lewis Eldridge's widow, Louise,at 25 Udall Drive. For those who do not wish to read through the whole thing, the short version is Louise inherited the property, maintained the old Georgian house, retaining title. In 1910, husband Roswell built the new, COLUMNED, house and named it 'Udallia'. As nearly as I can tell, there was no Lewis Eldridge, and I would guess that it is a corruption of 'Louise'. I should qualify. There was no Lewis Eldridge in the Great Neck equation. There was a Lewis Eldridge' residing on an estate in Hempstead. As to the charming Eyre design, as the date is the same year (1910) as the building of 'Udallia', could it be a rejected design? Back in the day the mailmen of Long Island must've been members of the Masons or some other secret society for having known the true ins and out of 'who is who' and where they all lived. Ha! How does one explain Page 54 of the link we both provided? "Since they had no children, Roswell's death left Louise as the sole mistress and heir to the entire Saddle Rock estate. "Trusts were established for Roswell's brother Lewis and his family living on the estate. Lewis Roswell (sic) and his wife Elizabeth Huyck had four children, two of whom died in childhood. In 1930, Lewis and Elizabeth built a house, called Redcote, designed by Delano & Aldrich, the most prestigious architectural firm associated with Long Island." Whew !!! Now I know more about the Eldridges than I do about some of my own family ! This is what makes O.L.I. so interesting ! Oy Vey Eldridge family ancestry information overload! Thanks Zack for all the family research. Me thinks Lewis also thanks you too. "Lewis Eldridge was indeed a real person"
Anyone know the name and location of the Lewis Eldridge estate in Hempstead? Okay, so one guesses that the 'Redcote' designed by Wilson Eyre for Louise was built for young Lewis and family, and that they later had Delano etc. replace it with a newer 'Redcote'? Or that 'Redcote was actually designed by Eyre, and got a later Delano & Aldrich attribbution? So Eyre only executed three commissions on Long Island out of seven planned. They are the Miss Lucille Alger Residence in Great Neck, the Theodore Conklin estate in Quogue and the Rolan Conklin estate in Lloyd Harbor. So Wilson had noting to do with Redcote. "Several other Eyre design projects on Long Island also apparently failed to materialize." One was for the George Kent house which was eventually designed by W.W. Bosworth. "Dating after 1912, an apparently unrealized sketch plan and sketch for a cottage for Roswell Eldridge at Great Neck is typical of Eyre's designs for small houses in the early 1900s." Yes? No? Maybe? Possibly? Possibly not? 'Apparently' is the operative word here. Something was built and called 'Redcote' and later remodeled by Delano & Aldrich. Could have been the Eyre house. Might not have been. Possibly, maybe not. Funny how some houses are so well documented that nothing is confused by history, and others, not so much. At this time there were at least two residences on the estate. There was Udallia where Roswell and Louise Eldridge lived. And Redcote where Roswell's brother Lewis and Elizabeth lived after moving from Hempstead. Since I'd imagined one couldn't ever be considered too obsessed to drop, even at this late date, a tidbit, or focus on a point someone else already referenced in passing. "..Udall property remained in the possession of Louise Eldridge, including the large Georgian pink-painted brick house called 'Saddle Rock'." Yes, before there was a 'Udallia' fronting on the bay facing the bolder eponymic for the village whose waters it's in, an earlier residence, of otherwise unknown origin, was likewise christened with the rock's name. Thanks goes to DED for the google books link.